In early November, Amazon released a new television commercial depicting a positive relationship between two friends sharing a cup of tea, some conversation, and a few laughs. One is Muslim, the other is Christian, and both are clerics. Together, they hit a viral chord, warming the hearts of many with a positive message that good conversations can occur between those who believe differently. But the 2 men aren’t just playing friends on TV! Yes, the commercial presented a picture of what could be, but the relationship between these two men actually has actually blossomed! No, they did not know each other before meeting on the set of the commercial—but the rest, you could say, is history. The two men have now struck up a real-life relationship. The immense popularity of this ad seems to indicate that the world is hungry for connection and conversation, contrary to what we might be led to believe. And that it starts as we know it often does. Simply, between two people or smaller groups—between friends. Rev. 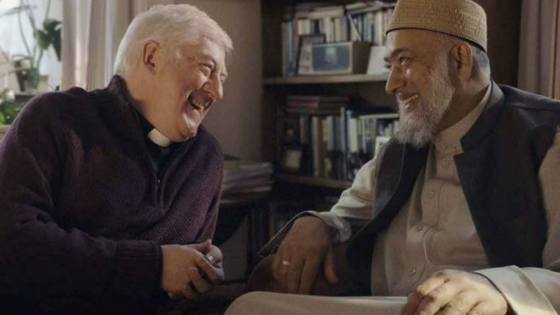 Gary Bradley (an actual vicar in London) and Zubeir Hassam (principal of a Muslim school in Leicestershire, England) continued their connection even after their work on the TV spot was done, became friends, and then sat down together, again, to discuss their participation in Amazon’s commercial and their newfound friendship. The world is willing to have them! The world is willing to watch them! But we have to “get on with each other” and cultivate relationships—friendships—in order to make spiritual discussion even possible. What does it look like to “rejoice in each other’s company,” and start “with the little things” as the men talk about here? Clearly they have established a beginning, and are both insistent that their friendship, trust and dialogue will continue. And you don’t have to get cast in a commercial to begin. Every day presents opportunities for us to begin new relationships and invest in those we already have. Who do you sit next to on the train? Who’s in the cubicle next to yours? Across the hall? In the elevator? At the gym? In the bleachers? Noticing, Praying, Listening, Asking Questions, Loving, Welcoming, Facilitating, Serving Together, and Sharing are all simple practices—or Arts—that build a foundation of relational trust and open the gateway for conversations about God to unfold naturally. Noticing, Praying and Listening will get you ready for spiritual conversations. Asking Questions, Loving and Welcoming will get you started with spiritual conversations. Facilitating, Serving Together and Sharing will keep your conversations going.